Please Note: Cat’s Corner has a special schedule in February 2019 due to private events at Swedish American Hall. No classes. No cover. Buy Drinks. 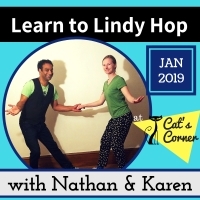 Get a double dose of Lindy Hop instruction in two ultra-fun 2 hour sessions on February 13 & 20. Nathan, Karen and special guest teachers will cover all the same material from our usual 4-week class program in a 2 evening format. Both Bootcamp Nights (February 13 -AND- 20): $50 online / $70 door. All class costs include dance party admission.